I had a great time attending the Walang Hiya Reading at St. Mary’s College. I was finally able to meet co-editor Roseli Ilano, and I also connected with the other anthology contributors. Roseli Ilano read from her short story and I particularly enjoyed David S. Maduli’s spoken word. Elsa Orejudos Valmidiano read from her poem “Mother Leyte” and another concerning the Maguindanao Massacre in 2009. I read an excerpt from my short story, Unripe Bananas, and also a longish poem that I’ve been working on for some time–a Waste Land inspired tribute to the trash heaps in the Philippines. 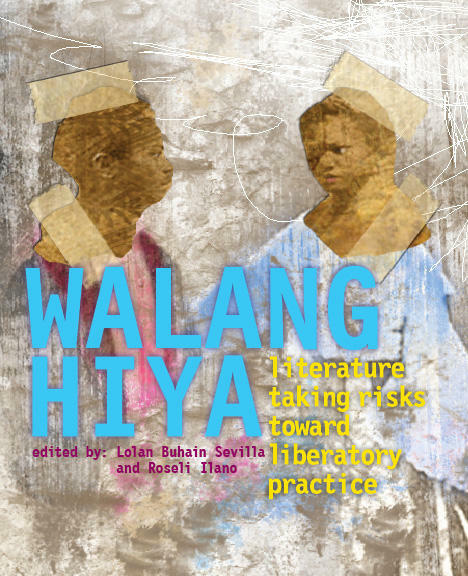 Thanks to Robin Martin for coming with me to the reading, to Joan Iva Cube for organizing the event at St. Mary’s College and also to Roseli Ilano and Lolan Sevilla for including me in the anthology. Free Filipino food from 6:30 -7:00PM! There is only one entrance to campus via Saint Mary’s Parkway. Once you enter campus and pass the Public Safety kiosk, turn right onto De La Salle Drive and then turn right into the first parking lot. The reading will take place at Hagerty Lounge, which is on the first floor of De La Salle Hall located on K7 of the campus map. When you enter through the double doors in the center of the building, Hagerty Lounge will be straight ahead. JOAN IVA CUBE was in the Philippines and immigrated to Southern California with her family in the early 80s. She earned her MA in Creative Writing and Asian Pacific American Studies from NYU. Currently, Joan lives in Oakland, California and works at Saint Mary’s College of California as the Director of the Intercultural Center. ROSELI ILANO is based in Oakland, California. With roots in youth organizing, she has helped build the capacity of Asian Pacific Islander Youth Promoting Advocacy and Leadership, Let’s Get Free (a project of the Ella Baker Center for Human Rights) and various organizations to integrate arts into social justice campaigns over the last decade. Her poetry has appeared in Maganda Magazine, her nonfiction in Filipinas Magazine. She curates the green fashion blog subtextstylevintage.com and is the co-editor of Walang Hiya: literature taking risks toward liberatory practice. DAVID S. MADULI is a Bay Area native. Based in Oakland, he is a veteran public middle school teacher, writer and DJ. JEN PALMARES MEADOWS received her MA in Creative Writing from California State University Sacramento and her BA in Literature from San Francisco State University. Delighted most whilst dreaming stories into life and onto the page, her writing can also be found in Filipinas Magazine and Tayo Literary Magazine. Jen resides in the Sacramento area with her husband and son, and is currently working on her first novel. ELSA OREJUDOS VALMIDIANO is a writer, poet, and activist. Philippine born and LA-raised, she currently makes her home in Oakland. She holds a BA in Literature from UC San Diego, a JD from Syracuse University, and is an MFA candidate at Mills College. Her work can be found in several Bay Area publications which include Maganda Magazine and Our Truths. Jen, this was a great reading and it is a beautiful book.